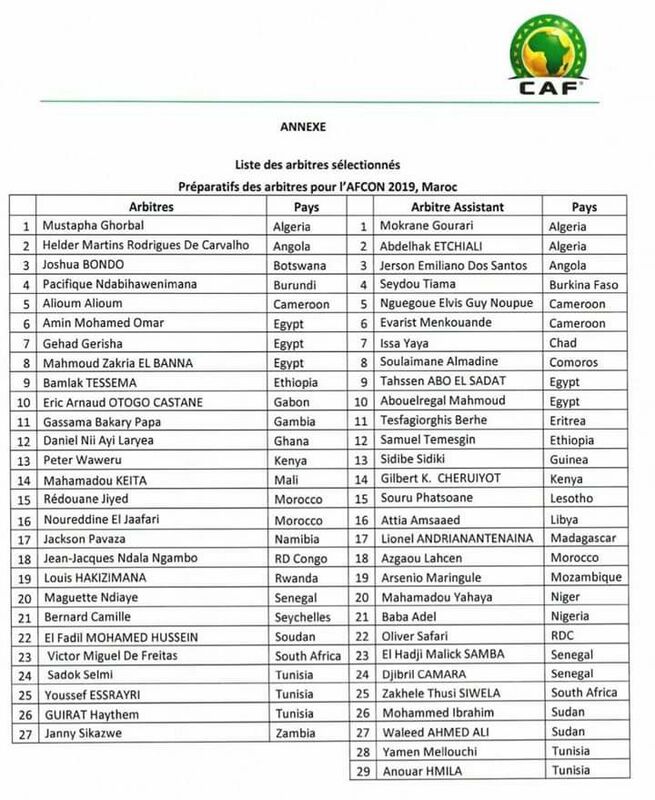 The Confederation of Africa Football (CAF) has released a list of match officials for the 2019 Africa Cup of Nations, set to be held in Egypt. The officials consist of 27 referees and 29 assistant referees that will manage the affairs of each game, at the 2019 AFCON from June 20th to July 17th. Top Africa Referees like Gassama Bakary Papa from Gambia, Janny Sikazwe from Zambia and Mahamodou Keita from Mali are all among the 56 officials. Tunisia and Egypt has the largest contingent of Referees and Assistants Referees for the biggest football tournament in Africa with 3 Referees and 2 Assistants Referees each. While Nigeria only have one Referee selected for the preparation work shop that will take place in Morocco which is Baba Adel who will act as Assistant referee. Algeria, Senegal and Cameroon also have the highest numbers of selected referees after Egypt and Tunisia with 3 each. Daniel Ayi Laryea will be the only Ghanaian to officiate in the 32nd edition of the Total Africa Cup of Nations .